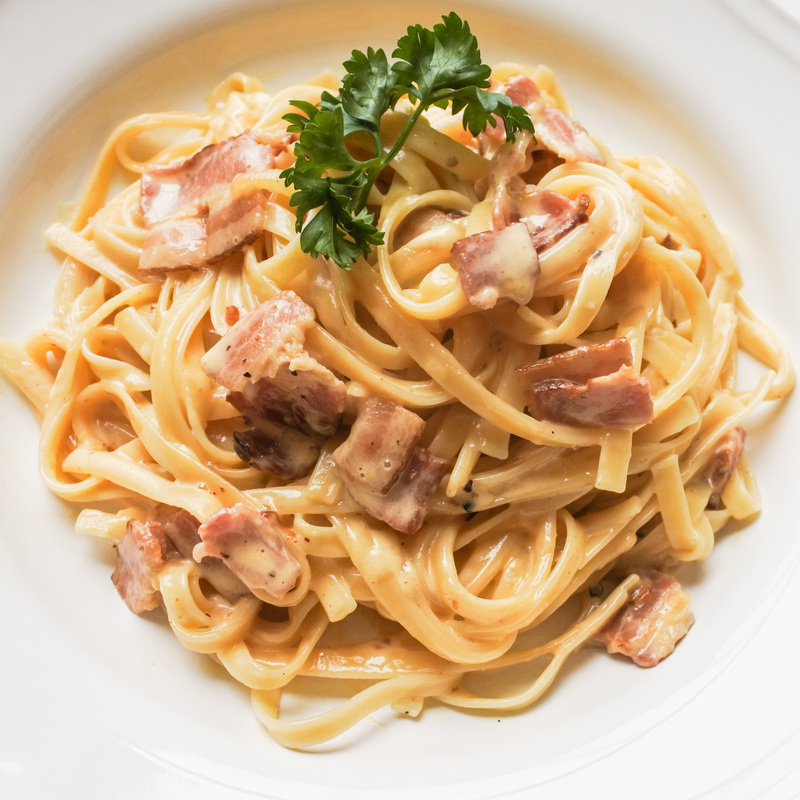 When I’m feeling particularly hedonistic, I find myself time and time again throwing together pasta carbonara for a decadent meal. One day I found myself in the midst of putting it all together when I discovered that there just wasn’t enough Parmesan cheese to make it to my liking. Still, the bacon was crisping and the egg yolks and cream were mixed together (yes, I use cream as controversial as that may be to use in a carbonara). There was no going back. As sinful as it may be, I must make it. Being resourceful I did my best scouring and found a suitable cheese substitute-chevre. I know you might be skeptical but the results were surprisingly sublime. By simple adding 2 tablespoons of that soft goat cheese to the egg yolk and cream mixture resulted in one of the best pasta carbonaras I have ever eaten. Now I can’t make it any other way. This pasta dish is smokey and salty from the bacon, creamy and unctuous from the egg yolk and cream and glossed in cheesy deliciousness from the chevre that lightly coats every strand of long pasta. I can’t get enough of it and I bet once you have tried it yourself, you’ll feel the same way. Separate egg yolks from whites and put into a medium sized bowl. Add cream and 2 tbsp of chevre to the egg yolks and mix until thoroughly combined. Set aside. In a large pan, cook bacon with thinly sliced onion and butter on medium heat. Cook until bacon is slightly crispy and onions have carmelized in the fat. Meanwhile, while bacon is cooking, fill a large pot with water. Bring to a boil over high heat and add pasta*. Cook until al dente or until you have achieved the desired texture. DO NOT DRAIN. When bacon has crisped and the pasta has cooked, turn heat to high. Take the pasta straight from the water and put into the saucepan with the bacon. Stir and let the pasta get coated in the bacon fat (about 2-3 minutes). Turn off heat. Eat and enjoy! Serves 2-4. Make sure to salt your pasta water. My rule is 1 tbsp of sea salt per 2 liters. If you find yourself with a lot of bacon grease, remove 1-2 tbsp. You don’t want anymore than 1 tbsp of fat from the bacon. In a large pan, cook bacon with thinly sliced onion and butter on medium heat. Cook until bacon is slightly crispy and onions have carmelized in the fat. Meanwhile, while bacon is cooking, fill a large pot with water. Bring to a boil over high heat and add pasta*. Cook until al dente or until you have achieved the desired texture. DO NOT DRAIN. When bacon has crisped and the pasta has cooked, turn heat to high**. Take the pasta straight from the water and put into the saucepan with the bacon. Stir and let the pasta get coated in the bacon fat (about 2-3 minutes). Turn off heat.